I got an email a few days ago asking whether the Medicaid expansion included in the healthcare reform bill would blow up state Medicaid budgets. I answered it and then forgot about it. Or I would have, anyway, except that we have an election for governor this year in California and Silicon Valley zillionaire Steve Poizner keeps running ads on my TV accusing Silicon Valley zillionaire Meg Whitman of, somehow, supporting Obamacare, which will blow up the state budget. The federal government will assume 100 percent of the Medicaid costs of covering newly eligible individuals for the first three years (2014-2016). Federal support will phase down slightly over the following several years, so that for 2020 and all subsequent years, the federal government is responsible for 90 percent of the costs of covering these individuals. According to CBO, over the next ten years, the federal government will pay $434 billion of the cost of the Medicaid expansion, while the states will pay roughly $20 billion. So it won’t cost states an extra dime through 2016, by which time our recession will presumably be over, and even after that states will only pay for a tiny fraction of the increased costs. 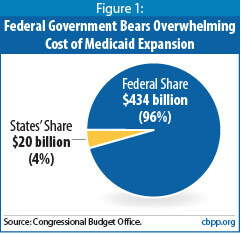 As CBPP points out, states will pay about 4% of the total costs of Medicaid expansion over the next ten years. This represents an increase in overall state Medicaid spending of slightly over 1%. Put another way, that $20 billion in state spending will insure an additional 16 million people, which works out to a cost per person of $125 per year over the next decade. That’s a pretty good deal. And not exactly fiscal Armageddon.